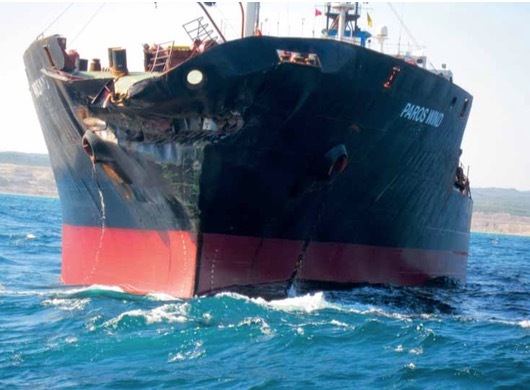 The bulk carrier industry is making progress on ship safety, at least in terms of ship losses. Allianz Global Corporate & Specialty report, Safety and Shipping Review 2015, found that total losses of all vessels had fallen from a high of 170 in 2007 to 75 in 2014 — figures for 2015 were not available as DCI went to press. Bulk carriers made up 94 losses out of 1,271 recorded over 2005/2014, with the annual figure over that period peaking in 2013 at 15 before falling to three in 2014.
recording just 15 losses over 2005–2014. By region,Asia continues to dominate the losses column, headed by ‘South China, Indo China, Indonesia & Philippines’ with 253 losses across all vessels counted over 2005-2014. As reported by DCI consistently over the last decade, cargo liquefaction has been a major cause both of losses and fatalities at sea for bulk carriers. Allianz was quick to raise the danger, warning that the threat of rapid liquefaction of cargo with catastrophic results has continued to plague the sector. The analyst noted two recent dry bulk carrier losses were suspected to have been caused by liquefaction — a phenomenon in which a dry cargo liquefies due to excess moisture and movement/vibration at sea.This can quickly cause a vessel to lose stability as the cargo sloshes around in the hold. “At the start of 2015, the 2006-built 56,009dwt Bulk Jupiter sank off the coast of Vung Tau,Vietnam, just a day before the 1984-built, 2,327dwt Cemfjord foundered off the coast of Scotland,” said the report. The Bulk Jupiter was carrying bauxite, while the Cemfjord was transporting cement. A subsequent report by the Bahamas Maritime Authority, the flag state of the Bulk Jupiter, confirmed that liquefaction of its bauxite cargo was the most likely cause of the loss of the vessel and the deaths of 18 Filipino seafarers. The report was later presented to the IMO’s subcommittee on Carriage of Cargoes and Containers’ (CCC) 2nd session last September, with BHA advocating “precautionary amendments to the Individual Schedule for bauxite” under the IMSBC Code to improve the safety of seafarers and shipping. The IMO responded by issuing a circular calling for increased scrutiny for the potential dangers of bauxite cargoes prior to shipping. rescued, but the ship’s chief mate died due to a heart attack during the rescue. “As a result of heavy weather conditions and adverse swell, the cargo in holds No 1 & 2 shifted, resulting in the vessel listing by 14 degrees starboard,” said a statement from Malaysian Bulk Carriers. David H Tongue, Secretary General of Intercargo and the subject of an exclusive interview in DCI next month, said the number of bulk carriers lost due to structural failure over the last ten years had been falling. However, he said he remained concerned about losses linked to liquefaction and welcomed recent research into the liquefaction of bauxite by Australia, Brazil and China, as well as work by an IMO Sub-Committee to evaluate the properties of bauxite and coal types that may liquefy. “The Bahamas report into the loss of the Bulk Jupiter was excellent,” he told DCI. “It was in depth, it was quickly made public and it identified the shipper as unco-operative. and the Middle East was turning the region into a major danger area to maritime operations, ships and seafarers. That was the conclusion of Dryad Maritime, a shipping intelligence company which recently released its 2015 crime statistics. Dryad’s sources identified 236 maritime ‘incidents’ in South East Asia last year. This compared to only 18 in the Indian Ocean, the source of much angst over the last decade due to Somali pirates. Some 50 incidents were recorded in the ‘Rest of the World’ and 49 in the Gulf of Guinea where kidnappings of crew is a major issue. Southeast Asia saw a 10% rise in maritime crime from 2014, continuing year on year trends, but Dryad said this could have been larger were it not for the success of the various maritime authorities in arresting maritime criminals. “The final quarter of the year saw a more proactive and effective approach to law enforcement, in particular from the Indonesian and Malaysian authorities, resulting in a welcome drop in crime levels,” sad Dryad. However, South East Asia remains a problem area, not least for bulk carriers. One of the most serious incidents recorded last year was in the Sulu archipelago, where a number of vessels have been approached by armed men in small fast craft which, after the ships’ Masters took anti-piracy measures, would retreat. Dryad said that on 18 December, approximately 7nm northwest of Doc Can Island Philippines, armed personnel in a speedboat fired upon bulk carrier Aqua Venture after they failed in a boarding attempt. “Whilst the initial report describes the personnel in the speedboat as robbers, it is unlikely that those seeking to carry out a simple theft would open fire on the vessel,” said the report. “These actions appear to be more indicative of Islamist rebels, such as the Abu Sayyaf Group, intending to kidnap crewmembers for ransom. Geopolitical tensions in the Mediterranean have made it the region of “most concern”, according to Dryad which cited continued civil war in Libya and the expansion of the Islamic State terrorist organization both there and in the Sinai as worrying developments. Ships being diverted to help migrants on distressed vessels in the Mediterranean were a continuing problem and one likely to worsen when the weather improved in the summer months. “Thankfully, attacks ashore, like those seen in Tunisia, have not been mirrored with incidents at sea,” reported Dryad. “Despite this, the unprecedented flow of desperate people, fleeing across the sea to Europe, has meant that the ongoing crises and instability across North Africa and the Middle East have had a significant impact upon maritime activities. “The war in Yemen has so far had minimal effect on the transit of shipping through the area, although the Saudi led coalition’s closure of the country’s ports has contributed to a humanitarian crisis ashore. The recent increase in hostilities between Saudi Arabia and Iran has the potential to add to the volatile geopolitical situation in the Gulf region. aced with rising operating costs and a plethora of emerging safety regulations, improving efficiency and safety has never been so important for ship owners. Mark Jones of PSM looks at how modern digital tank gauging systems can help with these challenges. Recent years have seen a quantum leap in marine technology with a move away from historical methods towards modern digital systems which use the latest instrumentation, software and communications technologies to deliver the high degree of reliability and accuracy required. New regulations under IMO and SOLAS call for the improved safety that such systems can supply. In addition, ATEX and IECex certified and marine approved digital tank gauging systems are now also increasingly a requirement for shipping organizations, providing a key driver in refit programmes. Modern tank gauging systems are designed to be flexible, providing continuous monitoring and measurement in real-time for a range of fluid types from fuel oil and lubricants to hydraulic fluid and bilge or ballast water with applications in all types and size of vessel and applications. The complexity of the system required will depend on the specific functionality required. Solutions range from discrete transmitters and switches to more complex radar-based measurement systems. A Windows software-based package, such as TankView from PSM uses a Modbus data communications network to acquire data on level, pressures and inclines from tanks, void spaces and bilges which is then displayed on touch screen panel-mounted PCs. The rugged design of the monitors ensures the displays will operate in the often harsh environments prevailing at sea, while the Modbus architecture allows multiple PCs to be used on the same databus, thus providing several points around the ship for the display and control of tank levels. Additional instrumentation, such as radar level or inclinometers (for trim & heel measurement) are easy to integrate into the same bus system for more complex installations. The RFM modules which partner the ICT1000 to provide safe networking and power cabling are housed in aluminium for below deck mounting or painted steel construction for above deck mounting to ensure protection for the system and operating reliability in all conditions. The whole life benefits of digital gauging systems in terms of repair and maintenance extend beyond commissioning to in service use. to reassign duties to substitute transmitters simplifies repairs and replacement as well as providing additional protection against system failure without the need to hold spares in transit. In addition to improved reliability, interoperability and ease of expansion are also key attributes of tank gauging systems. The digital route enables a more proactive approach to maintenance based on automatic fault-finding, via transmitters like PSM’s ICT1000, which have built-in diagnostics. In addition, modern digital tank gauging systems also enable other instrumentation to be integrated into the measurement loop which can then be used for simple routine calibration. A key driver in the switchover to digital systems is their cost- effectiveness and simplicity of installation. The type-approved and quality-certified range of transmitters, gauges and switches available from suppliers like PSM offer substantial cost savings during a ship’s construction or repair and enable a rapid fit-out even in the case of bespoke solutions and systems. Unlike traditional analogue systems which require a signal cable and barrier to be fitted for each sensor with multiple converters, digital systems require only a single power and communications cable, eliminating the need for multiple barriers and A/D converters, reducing installation time and materials costs by up to 50%. The availability of a simplified solution with software offering powerful functionality, should see a significant increase in the number of shipbuilders and operators opting to move up from more basic systems of measurement to a more technologically- driven approach, driving up the benchmark for systems performance, delivering improved efficiency and safety and helping to ensure industry compliance. Even the most seemingly safe deck machinery maintenance can be hazardous to bulk carrier crews, but Thordon Bearings’ ThorPlas-Blue provides for a safer working environment. In March last year, MARS, the Mariners’ Alerting and Reporting Scheme run by The Nautical Institute, reported that an ordinary seaman nearly lost his hand whilst carrying out routine maintenance on deck machinery. The seafarer was holding a grease gun in one hand while resting the other on the groove where the winch gear is engaged when another seaman began slowly turning the gear unaware his shipmate’s hand was in the mechanism. “It is incidents like this, which underscore the dangers seafarers face when undertaking even the most mundane and seemingly innocuous of tasks, that is a primary factor in the wider take-up of our self-lubricating bearings in deck machinery,” says Craig Carter, the head of marketing and customer service at Canada-based Thordon Bearings. Carter is referring to ThorPlas-Blue, the grease and maintenance-free polymer bearing introduced in 2007 as an alternative to the greased bronze bearings commonly found in everything from fairleads and lifeboat davits to winches, hoists and steering gear. Due to the corrosive nature of the marine environment in which above the waterline machinery operates, conventional bearings require frequent maintenance and grease lubrication to ensure machinery is operationally safe and reliable. But when routine maintenance is delayed or regular greasing is overlooked, machinery failure can occur, sometimes with catastrophic results. ThorPlas-Blue improves crew safety considerably as deckhands no longer have to grease bushings in hard to reach places,” says Carter. Aside from the obvious safety and environmental benefits, use of the polymer bearing facilitates a smoother more reliable operation of deck machinery since seized bearings from inadequate greasing is no longer an issue. This also reduces operational costs given that a seized bearing would often result in the need to replace expensive rope or cables, while piston and cylinder damage and subsequent mechanical failure arising from increased levels of vibration is avoided. “Shipowners also save on the costs associated with the purchase, storage and disposal of greases,” says Holmgren. These grease-free, maintenance-reducing attributes are due in part to the thermoplastic properties and its’ ability to withstand pressures exceeding 45MPa (6,527psi). In essence, the bearing is self-lubricating. The built-in lubricants throughout the homogenous polymer matrix ensure a low, stable coefficient of friction, even as the bearing wears. It also provides for much lower density to weight ratio in comparison to conventional metal bearings. ThorPlas-Blue bearings can be easily machined and installed quickly into a variety of applications where greased bronze bearings are traditionally installed. Applications include lifeboat and tender davit systems; fairleads, which can have a huge impact on mooring ropes that wear quickly; tiller arms and jockey bars; cranes and hoists; pivot point bushings; winches, capstans, water-tight doors and hatches. ThorPlas-Blue can also be supplied as a split spherical bearing (SSB) for use in rudder and steering gear systems to counter the alignment problems typical of hydraulic steering systems. As most bearings in the steering system are greased sleeve type bushings, there is no allowance for vertical movement of the tiller pins. However, the ThorPlas-Blue SSB allows the bearing to tolerate small angular misalignment resulting from deflection or improper mounting. Misalignment is not the only stress input on this type of product: vibration, corrosion, and pollution are also very damaging factors to the steering system. The ThorPlas-Blue SSB can prevent these potential failures from happening. Montreal-based shipowner CSL Group, which owns and operates a fleet of sophisticated self unloading vessels and bulk carriers, is the most recent ThorPlas-Blue proponent, having specified the bearing for fairleads in four vessels undergoing refit work at Me´ridien Maritime Shipyard in Quebec. Thordon Bearings will supply the yard with bearings for 51mm (2”) shaft diameters for installation to the self-unloading bulkers Baie St.Paul, Baie Comeau, Thunder Bay and Whitefish Bay. Installation was due for completion at the time of writing, in mid-February. Norsafe, renowned globally as a provider of in marine life- saving equipment, has designed a lifeboat specifically for the dry bulk vessel sector following requests from ship owners and ship managers for a compact high specification quality life- craft. It is also suitable for all ships that use free-fall lifeboats including LNG, and chemical tankers. The GES 21 is a totally enclosed free fall lifeboat taking up to 26 people. It is designed and manufactured according to latest SOLAS Classification Society and National Authority requirements and its construction fits in with client requirements for a reliable, low maintenance vessel. It can be launched from a hydraulic ramp which ensures the boat enters the water at a safe distance from the mothership with significant forward motion. Boarding is through an aft door with easy access to the seats on either side of the central aisle. Falck Safety Services and VIKING Saatsea have signed a preferred partnership agreement to offer unique blended learning STCW refresher training that combines onboard-online theoretical and practical exercises with practical onshore training. The unique training gives the maritime industry three benefits: lower costs, better learning and global consistency in how mariners are trained. The new offering, launched on 1 January 2016, forms an innovative answer to the maritime industry’s need to achieve full compliance with the STCW Convention and Code by 1 January 2017 in regards to training, certification and competency management. “In the past, learning was squeezed into a rather short period of time,” he says. “Research tells us, however, that this is anything but optimal for learning retention, which is why our new, joint training package with Falck Safety Services covers a five-year certification period that combines on shore practical exercises with onboard training in the participant’s real environment. VIKING Saatsea, with its unique digital platform, will offer onboard refresher theory training as part of the deal. The company’s solution enables crew to reduce their training time on shore, lets crew train at their own pace while at sea, and tracks competency status for easier administration. Company- specific training requirements and equipment can be added to the solution. safety training and brings practical, land-based STCW refresher training to the table, using its onshore facilities in 19 countries and at 38 training centres. In 2014 Falck Safety Services trained more than 370,000 people worldwide and thus brings deep expertise to the table. Working together, the two companies initially plan to offer seven courses, ranging from Sea Survival to Advanced Fire Fighting. The new training concept has been approved by the Danish Maritime Authority. By combining Falck’s safety training experience with VIKING Saatsea’s innovative technology we are creating a cost effective and high quality safety training solution for the industry”, says Torben Korsgaard, Senior Director of Global Business Development at Falck Safety Services. “VIKING and Falck have worked together for 30 years, so we know we can deliver high quality to the customers together”. VIKING Saatsea is a joint venture with leading marine and fire safety equipment and service provider VIKING Life-Saving Equipment. It provides a unique onboard training and administration platform to help ship and rig owners or operators improve their training capability. The advanced platform helps the company’s customers to avoid the delays, exposures to liability and financial losses that can result from inefficient, out-dated solutions to the onboard competency management and training problem. Falck Safety Systems is a global company operating 38 training centres in main oil hubs on six continents. With 372,000 course participants trained in 2014, Falck Safety Services is the world’s largest supplier of safety training for the oil and gas and maritime industries. The company also offers the broadest product range within safety services including bespoke courses, and has the most accreditations of any safety services provider, including OPITO, STCW, Norwegian Oil and Gas, and more. Falck Safety Services is a division in the Falck Group. ClassNK is a leading, non-profit classification society that provides the entire spectrum of class services for dry bulk vessels, supporting all parties in creating safe and compliant shipping operations. hands-on experience which allows a classification society to tackle these issues as they arise. Whilst many classification societies develop and update their design rules in line with IACS and IMO, ClassNK takes its commitment to ship design safety one step further by also carrying out damage analysis to improve the safety of all NK-registered vessels. ClassNK’s survey records have been collected over many years and serve as a fount of knowledge. When necessary, it uses these survey records when conducting damage analysis to identify the root causes. The results are then used to improve its existing rules. Using this system ClassNK can quickly advise on countermeasures to prevent the same kind of damage occurring in similar new vessel designs and make all NK-registered vessels safer in general. Five years ago, liquefaction of nickel ore cargoes on four vessels resulted in the loss of stability, subsequently capsizing the vessels, and costing the lives of 66 seafarers. While cargo-related matters had traditionally fallen outside the realm of ship classification, these tragedies spurred ClassNK to find solutions to prevent such losses in the future and so it developed the Guidelines for the Safe Carriage of Nickel Ore in 2011. These Guidelines compiled requirements from the IMSBC Code with precautionary measures and recommendations for safely loading and transporting nickel ore. ClassNK then conducted extensive testing and numerical simulations on cargo properties and the behaviour of nickel ore. Based on this research, it established the world’s first standards for stability, hull strength and other requirements necessary for vessels to safely carry nickel ore cargoes and published these in the Second Edition of the Guidelines for the Safe Carriage of Nickel Ore in 2012. These Guidelines have become the de-facto standard for transporting nickel ore and were widely praised by the industry, winning awards at the Lloyd’s List Awards and Seatrade Awards. As well as creating guidelines for the industry, ClassNK also supports the industry’s compliance with international safety regulations. Adopted in 2013, the IACS Common Structural Rules for Bulk Carriers and Oil Tankers (CSR BC & OT) were designed to enhance safety and reliability.Although they represent a major step forward for ship safety, they also present a number of new challenges due largely to the increase in overall vessel design time. To alleviate the burden of these new rules on ship designers, ClassNK developed PrimeShip-HULL (HCSR), a multi-functional vessel design support tool that makes it quick and easy for designers to carry out rule calculations and optimize their designs. Initially released in July 2012, ClassNK’s PrimeShip-HULL (HCSR) has quickly become the go-to design support system for ship designers worldwide with over 800 licences provided to more than 90 shipyards to date. ClassNK recently released PrimeShip-HULL (HCSR) Ver. 3.0.0. The new version is up to speed on all the latest rules and is fully compliant with the February 2016 corrections (Corrigenda 1) made to CSR BC & OT. Supporting safety compliance after vessel delivery is another key area of focus for ClassNK. To encourage design transparency throughout the life of vessels, the new SOLAS regulation II-1/3-10 made goal-based standards (GBS) applicable to bulk carriers and oil tankers of 150m in length or above for which the building contract is placed on or after 1 July 2016 or the keel laying data is on or after 1 July 2017. The regulation requires that a Ship Construction File (SCF) complying with GBS be provided upon delivery of a new ship. The SCF provides vital design and construction information to ensure the ship’s safety throughout its operational life. Some safety-related information must be stored on board whereas other information, such as the yard plan, lines plan and detailed structural calculations, is highly confidential and can be stored ashore. To protect intellectual property (IP) rights whilst remaining compliant, the industry needed a secure onshore digital archive centre. As the infrastructure of the industry, ClassNK responded by joining forces with software giant IBM Japan and The Shipbuilder’s Association of Japan (SAJ) to develop the world’s first GBS-SCF ashore archive centre. The neutral and independent platform, known as ClassNK Archive Center, provides secure storage for SCF information. Its customized IP-level access lets the shipbuilder set the desired IP security levels for each drawing and IBM’s cutting-edge Intrusion Prevention System further prevents any unauthorized access to the cloud database. The service will be online from July 2016, when the GBS will start to apply. As the only platform of its kind in the world that meets one of the essential requirements of the GBS, ClassNK anticipates its widespread use for all applicable vessels.